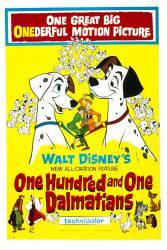 Trivia: According Disney there were 6,469,952 spots painted on the dogs in the original 101 Dalmatians. Trivia: Peg from "Lady and the Tramp" can be seen in the window of Percy's Pet Shop during the "Twilight Bark" sequence. Trivia: During the wedding of Roger and Anita, the stained glass window has several "Hidden Mickeys" on it.